Lawrence Castagna has been an Art Conservator for over 30 years. 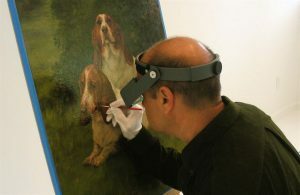 He is committed to providing the highest level of Fine Art Conservation. Our clients include: Museums, Art Galleries, corporate and privatecollections, and Historical Societies. Mr. Castagna has been a member of the AIC for over 2 decades and completed his formal training at Orin H. Riley Ltd. In the mid 1980’s. Prior to that he was studio assistant to Willem and Elaine de Kooning. He has a BFA in painting.